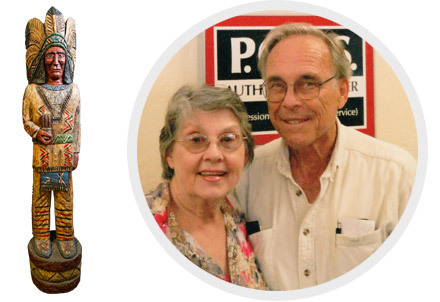 In 1982, the founders of Fresno Coin bought a Cigar Store Indian at a Pomona swap meet to be used as a decoration. After family friends Betty and Floyd Smith inquired about the Indian’s name, it dawned on Steve Sr. that they had overlooked naming him. He was immediately named in honor of Floyd Smith and has been part of the family ever since. Floyd resides in our Loan building at the Blackstone location. 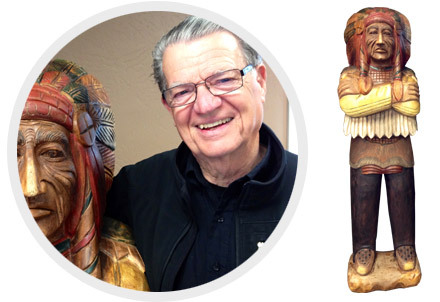 A customer approached Steve Jr. and said he had a Cigar Store Indian he wanted to sell. He was transported in the back of a truck to our Blackstone location, and was carefully stored away until the opening of The Showroom. 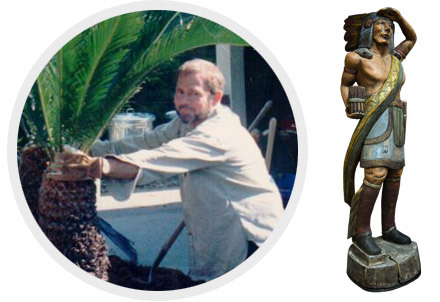 As family friend and sago-palm enthusiast, Leroy Boyd had previously passed away, the Indian was named in his honor, and has proudly watched over our fine jewelry and coin collection at The Showroom since 2009. When we were about to open our Downtown Fresno location in 2011, the relative of one of our employees offered to sell us a Cigar Store Indian. After seeing him, we decided he would be perfect fit for our downtown lobby. 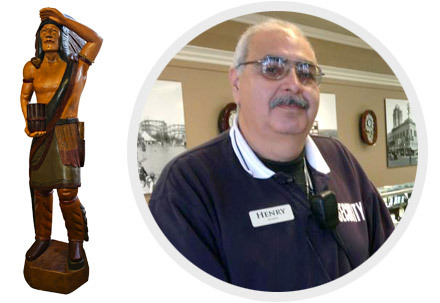 Because the Indian is always on the lookout, we decided to name him after our long-time and loyal security guard, Henry Sanchez. During a meeting with Tulare County Office of Education Superintendent Jim Vidak, we talked about the history of our Cigar Store Indians. With Mr. Vidak being such a respected leader and teacher, we decided to honor him by naming the fourth Indian Jim. Steve Jr. and Philip searched tirelessly online to find the perfect Chief to preside over Visalia Jewelry and Loan starting in 2013.